Nano in Torment: Tides of Numenera are the equivalent of spell casters from other fantasy games, prefer intellect over strength, however this time you are not really using magic, but ancient power left by previous civilizations. 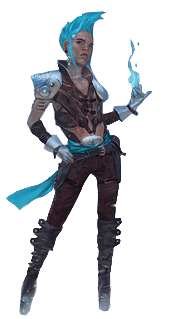 Nanos are sometimes called mages, wizards, sorcerers, or witches by the people of the Ninth World. Nano-sorcerer is also a common term, with their abilities referred to as nanosorcery. Some claim to be the representatives of gods or other supernatural agencies. Whatever they’re called, nanos master the mysteries of the past to the degree that they seem to perform miracles. They tap into the numenera to alter reality or learn things that they couldn’t otherwise know.